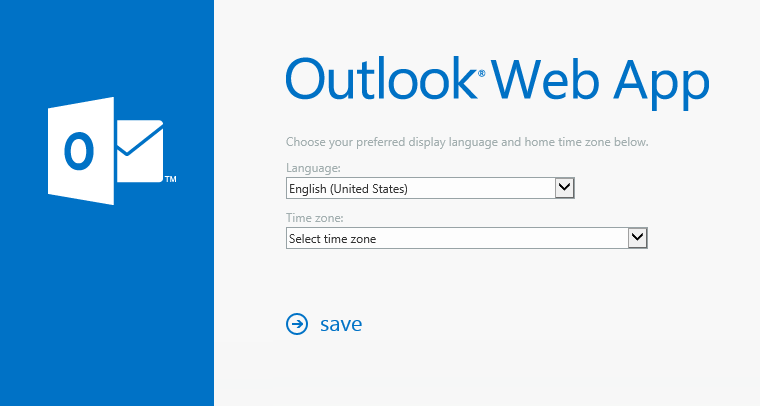 When a new Exchange Online mailbox is created the user is prompted to set language and time zone at first logon. This information is possible to pre-populate to make the experience smoother for the end users. This is particularly useful in a migration scenario. These settings are set with the cmdlet Set-MailboxRegionalConfiguration. This entry was posted in Exchange Online and tagged culture, language, regional settings, timezone on February 25, 2014 by Andreas Lindahl. During a file server migration several problems arise. Most of them are eliminated by using DFS Namespaces. With DFS all paths are kept the same even though the file server itself is changed. Having that in mind, I really hope that everyone is using DFS for file servers. In scenarios where UNC paths that points directly to the file server are used we have to find a way to minimize problems for the end users when the paths are changed. It is very common that end users have shortcuts on their desktops that point to folders and documents on the server. I will give you a simple script that will replace the path for you. This script is written in VBScript. The first two lines defines the old path, and what to replace it with. Run this script as a login script on your clients and you will have one problem less the day after your file server migration. This entry was posted in Windows Client, Windows Server and tagged dfs, file server migration, shortcut, unc on February 17, 2014 by Andreas Lindahl. Now when Multi Factor Authentication is free in Office 365 for all users, you might want to automate the activation of the service. And yes, you guessed it right, the way to do that is with PowerShell! 🙂 If you are running Office 365 in a Small Business or Small Business premium plan, this is currently the only way to enable MFA. In this case we use the Windows Azure Active Directory Module for Windows PowerShell, which can be downloaded from here. In order to enable MFA for a user with PowerShell, we need to use the the object Microsoft.Online.Administration.StrongAuthenticationRequirement and put that with some additional settings in to the StrongAuthenticationRequirements attribute. Note: After enabling MFA, the user will have to login through the portal and enroll their MFA methods and eventual app passwords before they will be able to logon to the services again. If we want to know what users that have MFA enabled, the attribute StrongAuthenticationRequirements tells us that a user has MFA enabled, and the attribute StrongAuthenticationMethods tells us that a user has enrolled their MFA methods (Phone, App, Text etc.). As seen in the screenshot below, only one of my MFA enabled users have actually enrolled their MFA methods. Not to hard, right? Consider adding this as a step for certain users (eg. admins or other user groups) in your automated process of enabling users in Office 365. This entry was posted in Office 365, PowerShell and tagged adding multi factor authentication powershell, azure multi factor authentication, enable multi factor authentication, mfa, office 365 mfa powershell on February 15, 2014 by Johan Dahlbom. Office 365, ADFS and double logons: WAP to the rescue! One of the things that are causing a lot of headache using ADFS with ADFS-proxy in combination with Office 365, is the fact that you have to type in your username twice when logging on to the portal or to the webmail externally. One way to avoid this is just go to the webmail directly using the address http://outlook.com/domain.com, but it might not be the easiest address to remember for your end users. Luckily enough, this has been sorted out when using the Web Application Proxy in Windows Server 2012 R2. The Web Application Proxy in Server 2012 R2 replaces the ADFS proxy in earlier versions of Windows Server, and have been expanded with functionality to publish other resources in a secure manner as well. 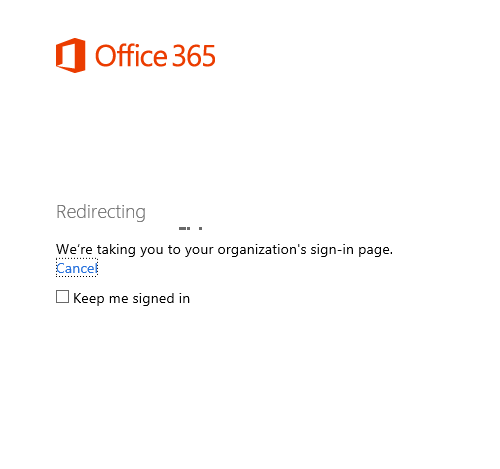 Here we are logging on as usual to mail.office365.com (or portal.microsoftonline.com), and of course the usual redirection is taking place after going to the password field. Earlier, this would have been the place where you were putting in your username once again. Not this time though, your username have now been passed along to the Web Application Proxy and you can continue by just typing in your password! This entry was posted in Exchange Online, Office 365 and tagged ADFS 3.0, double logins office 365, portal.microsoftonline.com, web application proxy on February 13, 2014 by Johan Dahlbom. Windows Azure Multi Factor Authentication is a great service/Product that gives you a complete MFA solution both on premise and in the cloud. The best thing is that as of yesterday, it’s free for all accounts and not just for admin accounts. Now you don’t have any excuses to not secure your admin accounts that have potentially access to multiple thousands of email accounts and other sensitive information. One thing that I have not been testing until today, was to activate MFA for a Federated Administrator(DirSynced account with global administrator rights). 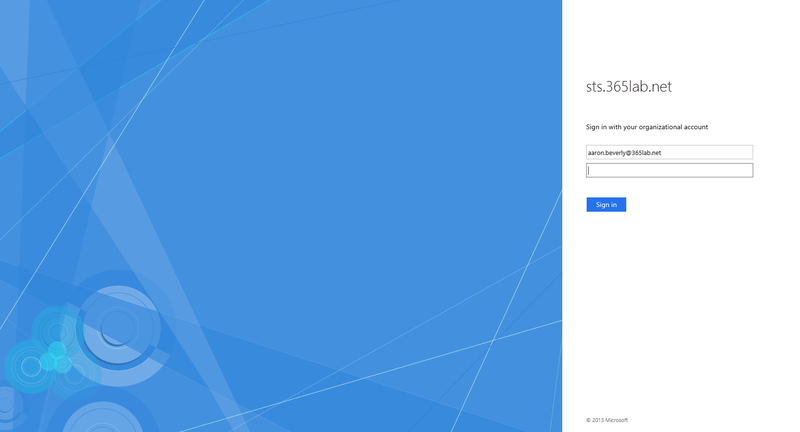 It works completely transparent for the user/admin, they just log on as they normally do to the ADFS server, and then the Azure MFA will kick in and require additional authentication. 1. Logon to the O365-portal, under users and groups, find the “Set Multi-factor authentication requirements” row and click “Set up”. 2. 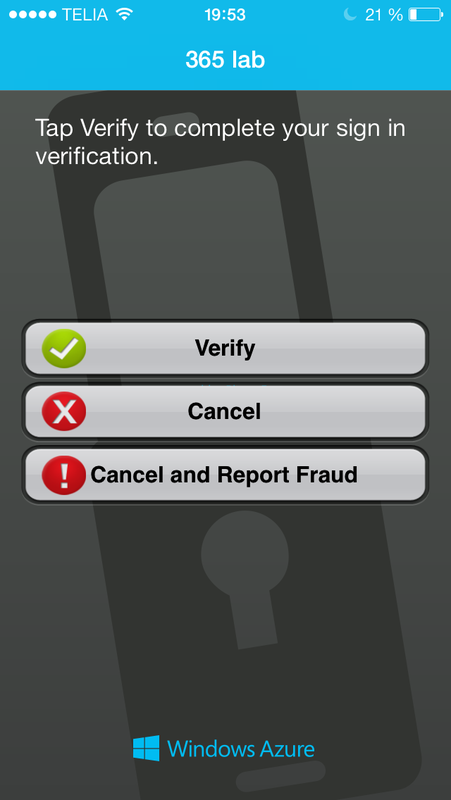 Choose the account(s) that you want to enable MFA for and click enable and then enable MFA. 3. After activated MFA, at next logon, the admin have to put in additional info about the second factor of authentication preferred. See the process to enroll devices as follows. Personally, I prefer using the mobile app as a second factor of authentication since its the easiest method, but it’s also possible to use text messages and phone for that. After verifying the activation with the Multi Factor Authentication app in my phone, I’m almost set, apart from one thing. 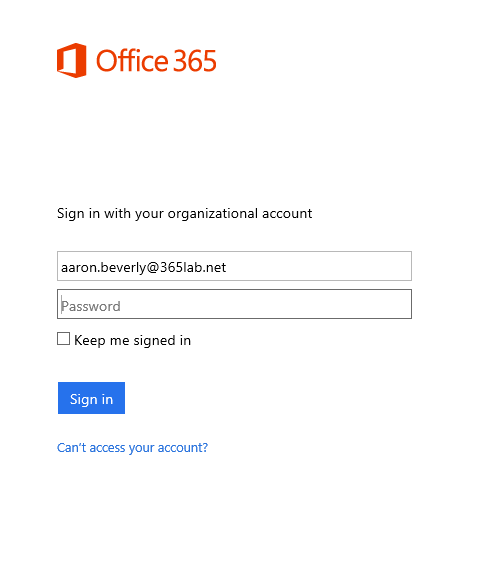 If you indend to use this account to connect to Office 365 with Outlook or ActiveSync, you will also need to create one or more app passwords that will be static passwords that can be used in cases where MFA doesn’t work. After creating eventual app passwords, you have now configured the specific account for multi factor authentication. Note that Microsoft is planning to add native multi-factor authentication for applications such as Outlook, Lync, Word, Excel, PowerPoint, PowerShell, and OneDrive for Business, with a release date planned for later in 2014. Was it Hard? – No! Should you use it whenever possible? – Yes! 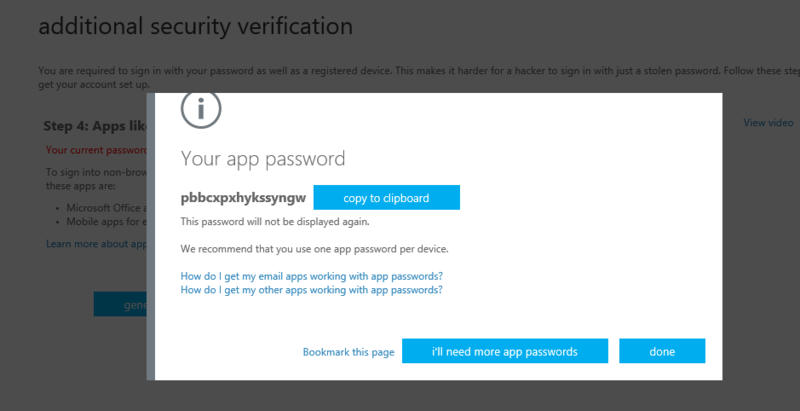 Now, what’s your excuse to not activate Windows Azure Multi Factor Authentication for your Admin accounts? 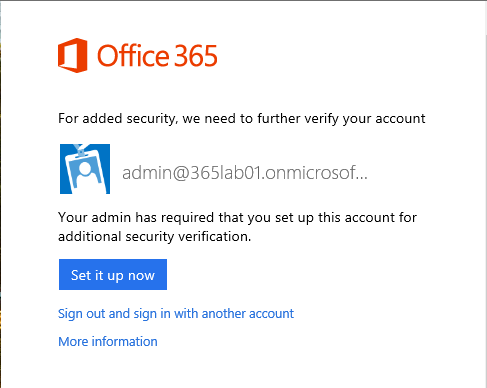 This entry was posted in Office 365 and tagged activate mfs for admins, azure mfa, azure multi factor authentication, mfa free, office 365 multi factor authentication on February 11, 2014 by Johan Dahlbom. A few days ago I got a new computer at work. I took it home to install it, but to finish the installation and log on with my domain account I needed access to the corporate network. I had to find a solution to finalize the installation without going back to the office. Luckily we have Direct Access configured at my company, and all I need to connect is a domain joined computer. A perfect opportunity to use the Offline Domain Join feature. This process is performed in two steps: First we have to provision the computer in Active Directory. We create a computer account, and store metadata about the computer in a file. The metadata file is then used on the computer to finish the process. We also need to issue a computer certificate for Direct Access, so we have to specify what Certificate Template to use. Now, I copy OfflineDomainJoin.txt to the new computer and run Djoin.exe again to insert the metadata into the computer. Please be aware that this file contains sensitive information and should not be sent unencrypted. Finally, a restart is required. After the restart I’m connected with Direct Access and it is possible to log on with my domain credentials. This entry was posted in Active Directory, Direct Access, Windows Client and tagged odj, offline domain join on February 10, 2014 by Andreas Lindahl. Quick Tip: Why are you still using nslookup? 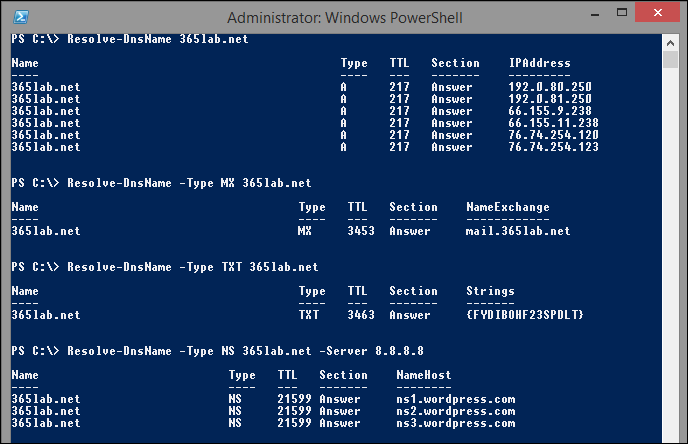 Still using nslookup when troubleshooting and verifying DNS records? Since Windows 8 and Windows Server 2012 arrived, I’ve been switching to the cmdlet Resolve-DnsName instead. It gives ju way nicer and much more structured data that easily can be used in scripting scenarios. It’s faster to write, just type Reso<tab> in your Powershell window. This entry was posted in Windows Client, Windows Server and tagged Nslookup, Resolve-DnsName on February 8, 2014 by Johan Dahlbom. Recently, I ran across an issue deploying DirSync at a Customer. The installation went well, but running the “Directory Sync Configuration Wizard” failed with the error message “There is no such object on the server”. Looking in to AD after the wizard had failed, no account had been created. I then noticed that the Users container in the domain root was missing. 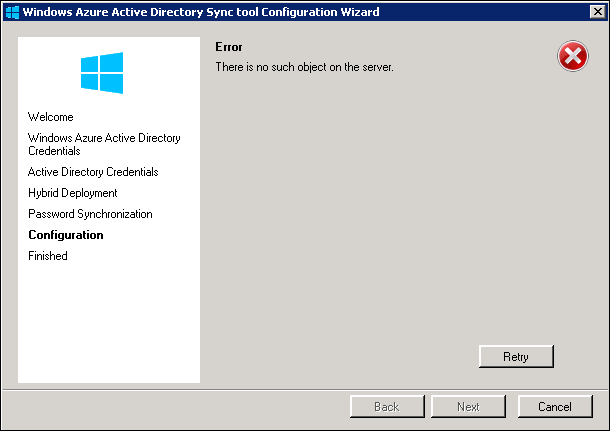 Since it is there DirSync by default tries to create the sync account and the container didn’t exist, it failed. After recreating the Users container (can be done with either AdsiEdit or PowerShell), the Configuration Wizard completed successfully. Hope this helps you if you are running in to this problem! This entry was posted in Active Directory, Office 365, Windows Server and tagged adsiedit, dirsync, There is no such object on the server on February 3, 2014 by Johan Dahlbom.